Does “Breaking Amish” reflect reality for Amish youth? There is little to nothing that suggests an “Amish mafia” actually exists. Both Amish and non-Amish local citizens dispute the depictions presented on the show. Amish which we have spoken to on the matter have expressed exasperation, annoyance, or a sense of humor on the existence of a supposed behind-the-scenes group of “enforcers” in Amish society. What’s more likely is that producers have helped to spin a narrative around individual happenings. Does “Breaking Amish” show typical Amish youth experiences? No. Though some youth engage in wild behavior, most Amish have a relatively tame Rumspringa experience. The experiences of youth on the show should not be considered typical or representative of what most Amish youth go through during adolescence. One likely reason is that public fascination with the Amish and demand for information about them has created an opportunity for networks and production companies. Besides the above-mentioned “Amish Mafia” and “Breaking Amish“, Amish have been the subjects of home improvement series and made-for-television films, alongside programs about former Amish. Amish do happen to view television from time to time, whether it is while visiting an English friend or neighbor, or in a public place or business such as a doctor’s office. Amish do not own televisions nor do they encourage watching them, however. What programs or films are reliable sources of information about the Amish? A good documentary is The Amish (PBS, 2012), made with extensive input from both Amish and academic experts. You can view that film in its entirety here. Burton Buller’s films The Amish: Backroads to Heaven (2007) and The Amish: How They Survive (2012) are also good choices. Hambright, Brett. “Is ‘Amish Mafia’ real or fake? Lancaster County viewers weigh in.” Lancaster Online. Lancaster Intelligencer Journal/New Era, 30 Dec. 2012. Web. Accessed 2 Mar. 2015. Falzone, Diana. “Amish Mafia’ star Levi Stoltzfus says some Amish are hypocrites.” Fox 411. Fox News, 2 Apr. 2015. Web. Accessed 16 Apr. 2015. To Cite this Page: Wesner, Erik J. “TV Shows.” Amish America. Erik Wesner, 28 Feb. 2015. Web. [Date Accessed]. 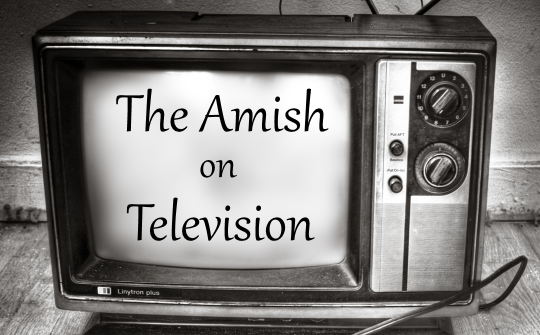 <http://amishamerica.com/tv-shows/>.